15 Clifton Park01263 715779work01603 870304fax Self-catering15 Clifton Park, a detached house with sea views, is situated in the town of Cromer in North Norfolk with many attractions including its beaches, seafood, golf course, museums and restaurants. The property is a good base for exploring the beauty of the North Norfolk coastline. • Good Housekeeping Deposit: Please note that a refundable deposit of £150 is required for this property. 15 Clifton Park, a detached house with sea views, is situated in the town of Cromer in North Norfolk with many attractions including its beaches, seafood, golf course, museums and restaurants. 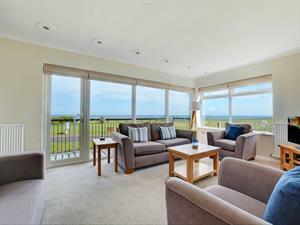 The property is a good base for exploring the beauty of the North Norfolk coastline. Facilities for children: stairgate Children welcome from any age. From A148. Take a left turn after the station into Beach Road. At the T-junction turn left, Clifton Park is the 5th road on the left. From Cromer - 0.50 mile.